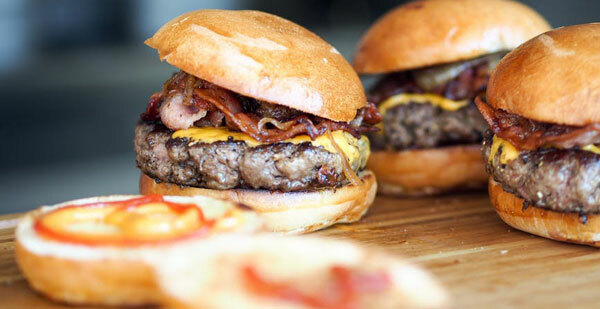 When it comes to fast food, burgers are one of the nation's favourite guilty pleasures. More and more burger joints are popping up throughout the capital, each with their own riff on what goes into the formula for a delicious burger. And the burger business has proved extremely lucrative for some restaurateurs, leaving them with busy restaurants, and in some cases, allowing them to open multiple eateries across the city. With that in mind, we've picked out some of the best places to go for your fix of meaty, cheesy, gooey goodness. Some of the restaurants featured stick to the basics, serving simple, uncomplicated burgers, whereas others are a little more outside of the box with their offerings. Honest Burger is a true London institution, with restaurants in Soho, Brixton, and King's Cross. They place a huge emphasis on Great British produce here, and their homemade rosemary fries are the stuff of legend. On the menu, you will find a small range of chicken, beef and veggie burgers, which means there's something for all tastes. If you're looking to add a little extra to your meal, check out their range of housemade dipping sauces, as well as their apple, beetroot, and cabbage coleslaw. Burger Bear has won lots of fans thanks to eats big, juicy patties, as well as its famed bacon jam. The menu packs a serious punch, with lots of meaty creations, including classic cheeseburgers, bacon cheeseburgers, as well as burgers drenched in chilli sauce. The restaurant even accepts Bitcoin for payment. Bitcoin is popular within the tech, digital and gaming sectors, including online casinos which you can visit and play games like blackjack, slots and baccarat using a laptop or mobile. However, the digital currency is now breaking out from these niches, and is starting to crop up more frequently throughout London stores and restaurants, with trend-setting eateries like Burger Bear leading the charge. Hachè has the most creative menu in London when it comes to burgers. Here you will find an extremely wide variety of unusual and exciting burgers. Their specialty Scotch beef steak burgers are most popular and come with delicious toppings such as truffled Gruyère cheese, and even crunchy peanut butter. If you're bored of the usual tried and tested burger combinations, Hachè will have something that will grab your tastebud's attention. Patty & Bun is another hugely successful burger brand in London, with six branches throughout the city, which can be found in trendy locations like Soho, Marylebone, and Fitzrovia. The chain is proving extremely popular with London's younger, burger obsessed crowd. You'll find a mix of classic burgers, as well as some new, inventive twists, such as a lamb burger topped with buttermilk courgettes, pickled aubergine, and cumin aioli. If you're craving a good burger, check out the restaurants above for some of the juiciest patties the capital has to offer. Do you have somewhere you recommend to our readers? Get in touch and let us know, if we like it, we'll recommend it.